1941-1954 & 1962-1972 7" Headlight bulb retaining ring. Polished stainless steel. 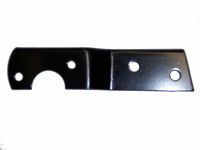 License plate holder Stepside or fleetside1960-1966 rear license plate holder. 1964-1966 Chevrolet pickup truck headlight bracket, LH. 1964-1966 Chevrolet pickup truck headlight bracket, RH.